Insert loop into next dc, pull up loop, (twice) yrh pull through all loops. Rpt last row 3 more times, making 5 rows in all. Turn. Fasten off. Instep - Change to 4.00mm hook. Next row - 1ch, 1dc into base of 1ch, 1dc into each of next 8dc. Turn. Rpt last row 6 more times until 8 rows have been worked in all. Fasten off. Shape Sole - Using 4.00mm hook. (------------- see picture below) follow direc tion of arrows. Row 2 - Make 1ch, 1dc into base of 1ch, 1dc into each dc to end, ss to first dc. Turn. Make 1ch, with WS of bootie facing, ss through both sides of dc to close open gap on sole of bootie. Finishing - Weave in all ends. Turn through to RS. Motif x 2 - Make magic circle, using 4.00mm hook work 1ch, 12dc into circle, close circle with loose thread of yarn, ss to first dc. DNT. 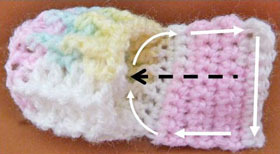 Finishing - Sew in and tie off any loose ends of yarn, attach decorative button or ribbon rosebud to centre of motif and sew one motif to each boot. 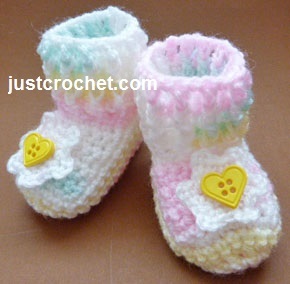 Hope you enjoy this free baby crochet pattern for ribbed booties.